Mozilla is an Open Source Web browser for several operating systems. Work is continuing on new features and bug fixes. Mozilla is available for all versions of Windows from Windows 95 onwards. Mozilla automatically chooses fonts for most Unicode ranges and writing systems, but for some encodings you can specify the font that you want Mozilla to use. The lists of fonts are restricted to those that support the chosen encoding. You can set a different font for each writing system, for example Tahoma for Western, MS Gothic for Japanese, and Aisa Unicode for Greek. In the Preferences dialog box, select “Fonts” (in the Appearance category). 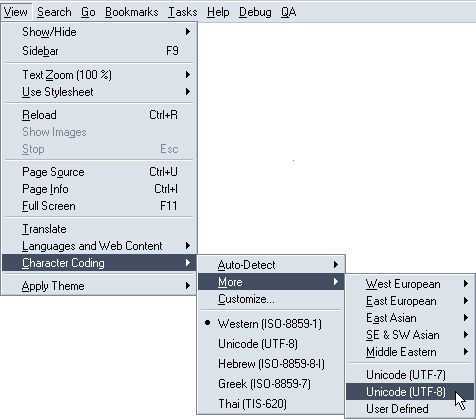 Click the black down arrow to the right of “Fonts for:” and select an encoding from the drop-down list. Click the black down arrow to the right of “Proportional:” and select either serif or sans-serif. Depending on your selection for Proportional, click the black down arrow to the right of either “Serif:” or “Sans Serif:” and select a suitable font. Optionally, choose fonts for other font styles. Optionally, choose font sizes for Proportional and Monospace. Repeat steps 3–7 for each encoding that you want to use. Click the “OK” button to close the Preferences dialog box. From Character Coding on the View menu, you can select an alternative such as Unicode (UTF-8 or UTF-7) or a specific language. On the File menu, select “Preferences...”. 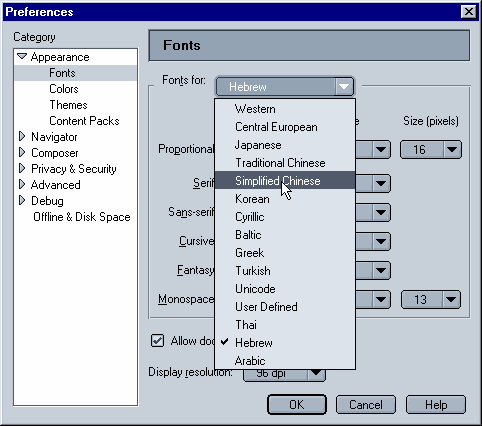 In the Preferences dialog box, click “Languages” in the Navigator category. In the Character Coding area, click the black down arrow and select an encoding. Mozilla can use characters from several Unicode ranges to display a single Web page, and appears to be able to interrogate the operating system to identify fonts that include characters from any required Unicode range. Mozilla can display all of the HTML 4.0 character entity references. It can also display numeric character references, such as those used in the Unicode test pages, independently of the document’s character encoding. It can also display hexadecimal character references. Mozilla does not implement any alternative encoding (character coding) that you select from the View menu if the page has a charset specified in a meta tag. Mozilla for Windows 95, Windows 98, Windows ME, Windows NT4, Windows 2000 and Windows XP can be downloaded from the Releases - Mozilla page. The Composer HTML editor is included, which can save documents in a wide range of encodings (including UTF-8), and supports Microsoft’s Visual Keyboards and Global IME.